Being offered at $2,995 by Apple Music in Portland, Oregon (September 2014). Price is a bit on the high side considering that one of the pickups is a reissue and the case is not original. Also said to be missing its truss rod cover, which is a part you almost never see. 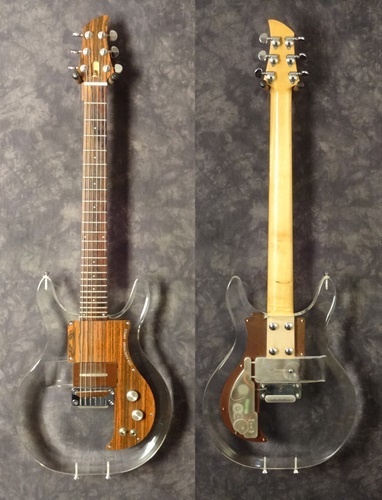 "This unique 1969 Dan Armstrong acrylic guitar is an excellent example of the collaboration between Dan Armstrong and Ampeg. Production of the double cutaway "see through" instruments began in the U.S. in 1969 and only lasted until 1971. Dan Armstrong put his amazing design sense and preference for quality to work combining new materials for the body and a revolutionary interchangeable pickup system. 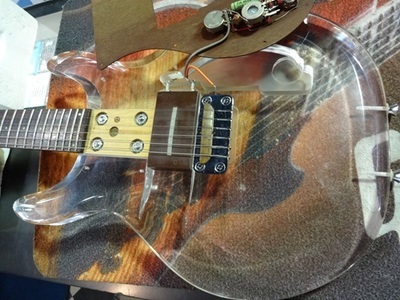 The 9.6 pound guitar has a contoured plexiglas body with a maple neck. The rosewood fretboard with 24 frets has excellent access to all the frets. The neck scale is 24 3/4" and the nut width is 1 3/4". 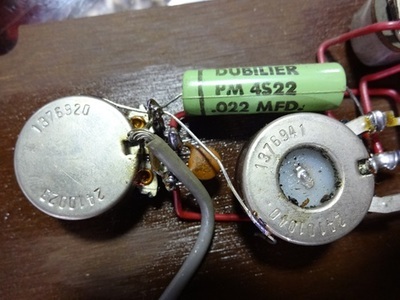 Visible on the bass side of the neck joint is the stamped serial number, A1438D." "One of the most unusual features of these guitars is the pickup that was designed in cooperation with Bill Lawrence. There is a channel routed out of the acrylic material where an interchangeable single coil pickup can be slid into place under the strings. 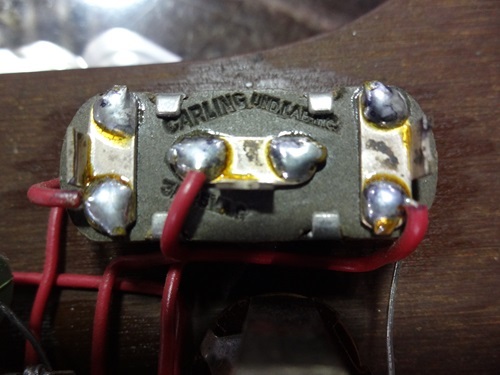 Pickup replacement is as simple as loosening a thumb bolt, sliding one pickup out and sliding another in place. Both pickups that came stock with the guitar are included: a CB (Country Bass) pickup and a RT (Rock Treble) pickup. 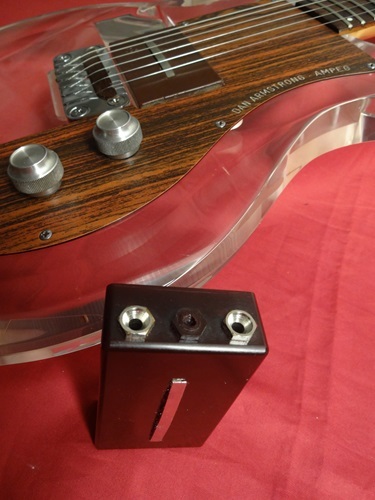 These pickups have a bar type magnet molded in brown resin. The volume pot code is 1376941 which is from the 41st week of 1969 and the tone pot code is 1376920 or the 20th week of 1969. The three way switch is made by Carling Ind. Lab. All electronics appear to be original. The brushed aluminum volume and tone knobs, three way switch and output jack are all mounted on the scratchplate. Other features include a textured formica wood grain scratchplate engraved with Dan Armstrong Ampeg in white lettering, a matching formica headstock overplay, Grover Pat. Pend. rotomatic tuners, dual oversized strap buttons on the bottom of the guitar and one on the bass horn, and a chrome combination tailpiece and bridge with a rosewood saddle." "The guitar is all original except for the missing truss rod cover and a replacement thumb bolt on the back of the guitar. The frets are in very nice condition and show very minor wear. There are a few dings on the back of the neck but overall it is in great shape with nice grain. The acrylic body shows very little wear. It has a nice robust neck. The rock treble pickup has a big, rich, full tone with hot output while the country bass pickup has medium output and flatter response. With its ergonomically designed plexi body the guitar is comfortable. These acrylic Dan Armstrong guitars were such a revolutionary design it's crystal clear why they ended up in many museums around the world. Keith Richards and Ronnie Wood are among the notable players of Dan Armstrong plexi guitars. 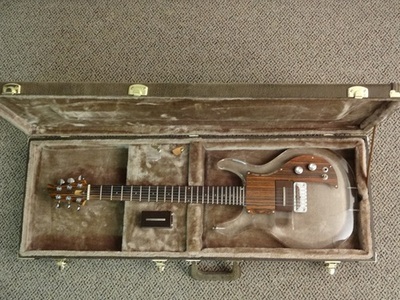 The guitar comes with a new rectangular vintage style Gator brown hardshell case."